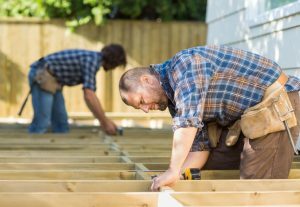 Whether you want to build a new deck yourself or call in the pros to do it for you, there are a lot of important requirements and steps you have to keep in mind. A deck is a beautiful addition to any home, but it has to be thought out properly, to avoid the construction gaining instability over time or even crumbling before it’s finished. Preference should, of course, take precedence. Before you get started on building your deck, consider your daily habits, the number of people who will use the deck and the amount of time you’ll be spending there. Based on that information, you’ll already have a general idea of where you want your deck and how large it should be. Next, make sure you pick the right materials. While all materials have their own pros and cons, composite, pressure-treated wood, cedar and PVC are considered the best, and you can use each depending on your scope and budget. Finally, make sure you always first contact Colorado Springs utilities locations and have underground cables mapped before doing any digging. Also make sure you hire a dependable contractor who is known to build quality decks that can withstand the test of time. Balance and stability are the most important key factors, so make sure that the contractor you hire has the tools and expertise to get the project done while keeping that in mind.